Canada has named a 24-player roster for the upcoming Men's International Friendly match against Ghana on October 13th. The roster features a mix of experienced players and new faces as Canada continues its preparations for November's FIFA World Cup Qualifiers in Vancouver. Earning their first call-ups are Fraser Aird, Marco Bustos, David "Junior" Hoilett, and Wandrille Lefèvre. In addition to recent surprise additions of Aird and Hoilett, striker Lucas Cavallini also makes a surprising return to the national team squad after declining previous call-ups by Head Coach Benito Floro. 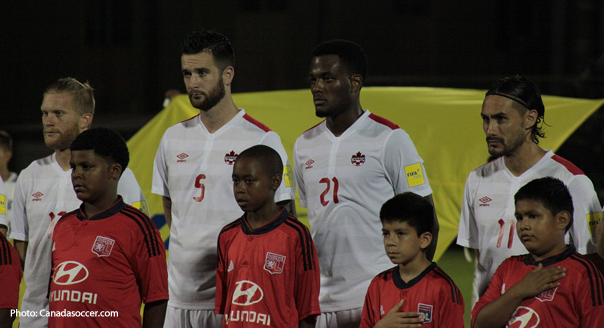 Junior Hoilett, Lucas Cavallini and Fraser Aird are all on #canMNT’s roster for this Ghana game. Wow. "It is always important to provide an opportunity to new players to be integrated into the team from a tactical and social point of view," said Canada's head coach Benito Floro via press release. "To be part of future camps and our journey to Russia 2018, it was essential we brought them into our program this month for the Ghana match." "Things are progressing well on all fronts and we now look forward to our next challenges," said Floro. "We will continue to focus on our key objectives and the required performance standards for the team moving into the next stage of FIFA World Cup Qualifiers." With so many young players named to the squad, Floro will likely lean heavily on a key group of veterans for the match against Ghana, including Marcel de Jong, David Edgar, Andre Hainault, Simeon Jackson, Adam Straith, Tosaint Ricketts, Milan Borjan and Kenny Stamatopoulos.